The formula consists of Morphine Sulfate (An opiate analgesic related to heroin), sodium carbonate (water softener), spirits foeniculi (an alcohol that seems to be only associated with this product), and aqua ammonia (a cleaning agent). I find it had to believe that it was “pleasant to taste”. 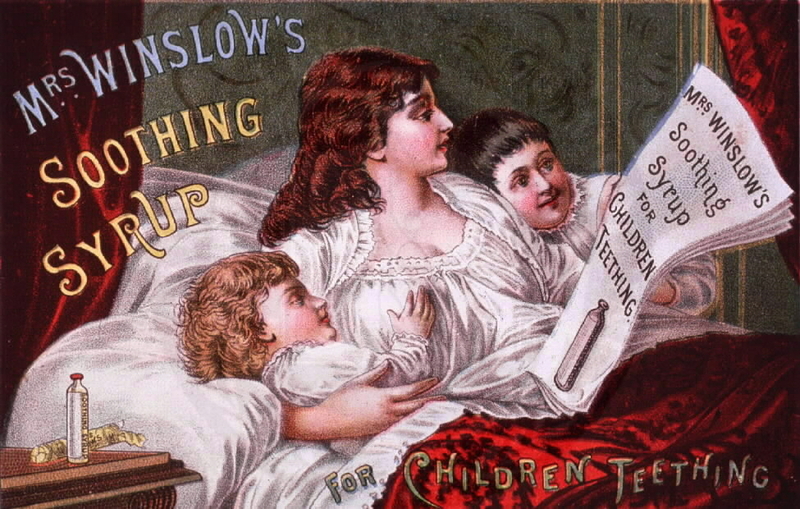 Courtesy of the US National Library of Medicine, here’s an 1885 advertising image produced by Meyer, Merkell & Ottmann in New York. The product was widely marketed through newspapers, parenting information and even postcards and found favour with solders returning from the battlefields of World War I. It was eventually withdrawn from sale here in Queensland after State Government investigation into child deaths associated with the medicine. The results eventually contributed to the strict controls we have in our pharmacies today and the process drug companies must complete before their products are certified.